Time for a new vision for Charlotte? What kind of city is Charlotte? If we had a shared story, what would it be? 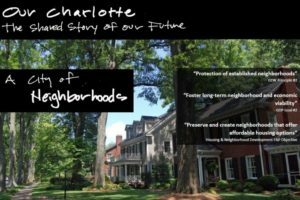 As the City of Charlotte explores how to reorganize and update its various overlapping development ordinances into one Unified Development Ordinance, the question arises whether Charlotte also needs a comprehensive plan – or at least a refreshed vision of its future.